The age of the Moon is a measure of the phase of the Moon, counting the number of days since the last new moon. The phases of the Moon cycle roughly once every 29.53 days, a period known as the synodic month. The Moon appears full at the midpoint of the cycle, at an age of around 14 days, and reaches new moon again when it is around 29.53 days old. 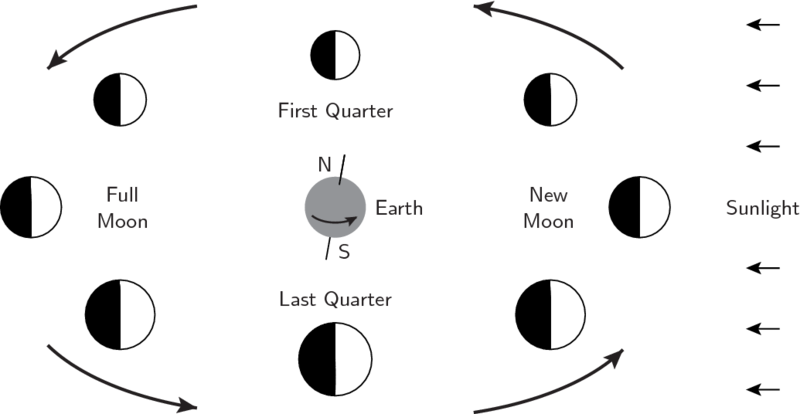 The Moon's cycle of phases is commonly divided into four week-long intervals, divided by its principal phases, when it appears at new moon, first quarter, full moon and last quarter. In the first week after new moon, the Moon appears as a waxing crescent in the evening sky. The Moon is said to be waxing when the fraction of illuminated surface as seen from Earth is increasing, and is said to be a crescent when less than half of the Moon's disk is illuminated. After passing first quarter, the Moon shows a waxing gibbous phase. The Moon is said to be gibbous when more than half of its disk is illuminated. The Moon's phases appear to cycle as it orbits around the Earth. At all times, the half of the Moon's surface that is facing the Sun is illuminated. When the Moon passes close to the Sun in the sky, it passes between the Sun and Earth, and so the side that is illuminated by the Sun is almost exactly opposite to the side that we see. This is why the Moon appears unilluminated at new moon. Two weeks later, when the Moon has completed half an orbit around the Earth, the Sun, Earth and Moon once again lie in an almost perfect straight line, but this time with the Earth in the middle. Our sight line to the Moon is then almost exactly aligned with the Sun's sight line to the Moon. Consequently, the side of the Moon that is illuminated by the Sun is almost exactly the same side that we see. This is why the Moon appears fully illuminated at full moon. As the Moon's phases cycle, so too do the times of day when it is visible. At new moon, the Moon lies close to the Sun in the sky, and so tends to be above the horizon only when the Sun is also above the horizon. This means that it is only visible during the daytime, and is too close to the Sun to be seen. In the week following new moon, the waxing crescent Moon becomes visible in the dusk sky after sunset. Gradually, it moves eastwards through the constellations, at a rate of half a degree – one Moon width – per hour. As it does so, it sets around 49 minutes later each day, becoming visible for longer after sunset each day. When it reaches full phase, it appears almost exactly opposite to the Sun in the sky. This means that it is above the horizon only when the Sun is below the horizon. Consequently, it is visible for most or all of the night from most locations. After full moon, the Moon continues its gradual eastward journey through the constellations, heading back towards the Sun. Rising around 49 minutes later each day, it recedes from the evening sky until it is only visible in the pre-dawn morning sky. The times around first quarter and last quarter, when the Moon shows half phase, are ideal for observing it with a pair of binoculars or small telescope. The border between the light and dark portions of the Moon's disk, called the terminator is an ideal place to look for detail on its surface. This line marks the division between the areas on the Moon's surface where it is day and night. An astronaut standing on this line would either see the Sun rising or setting on the horizon. Just as on Earth, objects cast very long shadows at sunrise and sunset. As a result, the shadows cast by lunar mountains and crater rims are especially easy to see under these conditions along the terminator line. At first quarter and last quarter, the terminator line is particularly well presented for view. By contrast, at full moon, there are no shadows visible on the lunar surface, and comparatively few craters are visible.